The original objective for Wise Use was to develop and test a framework for assessing the feasibility of Working for Water rehabilitation leading to wise use, through exploring the resilience and adaptive capacity of the socio-ecological system. The Wise Use of Wetlands Project works with communities to ensure that the rehabilitation of wetlands is sustainable. The project started in response to issues that the national Working for Wetlands programme noted following rehabilitation efforts. The Wise Use project focused primarily in a group of community members known under the project as Community Resource Monitors (CRMs). The CRMs are currently supported through the Extended Public Works Programme and are ready to play and active role in ‘up-scaling’ by acting as mentors for others in the community. This was felt to be an important step in building the Wise Use approach into community governance structures and at the same time embedding the idea of local custodianship in the ongoing social fabric and functions. 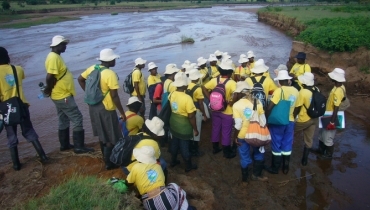 This direction was called for and endorsed by the local council of community chiefs at a recent two day Ha-Makuya Wetland Indaba facilitated almost entirely by the CRMs.